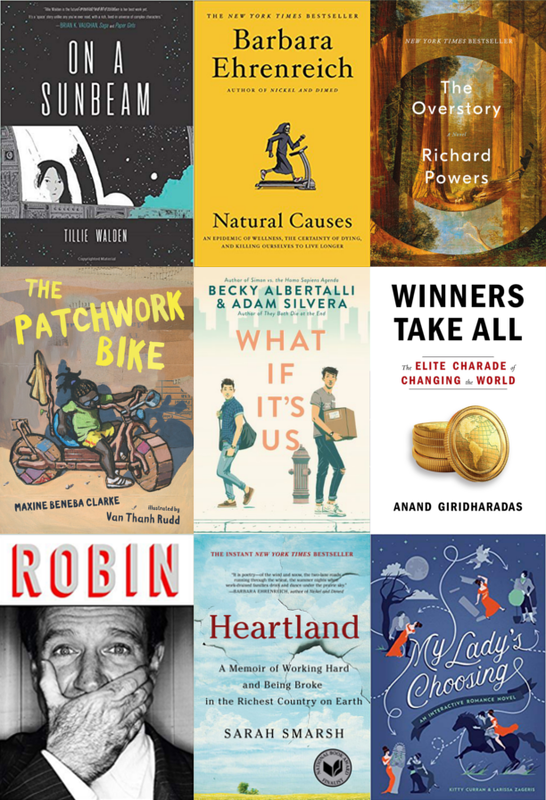 With another year in the books, LPL staff from all across the library share their favorite new titles of 2018. Can I cheat and choose two? I’m going for it. These fantastic graphic novels are both set in space, but couldn’t be more different. Aliens: Dead Orbit is a thrilling, violent, meticulously drawn original Alien story that captures the claustrophobia and isolation of Ridley Scott’s masterpiece. On A Sunbeam is a heartwarming found family adventure whose strengths lie in its richly characterized cast, Walden’s expert use of limited color palettes, and her gorgeous sketch-like linework. Natural Causes: An Epidemic of Wellness, the Certainty of Dying, and Killing Ourselves to Live Longer by Barbara Ehrenreich—health is no reward, and illness isn't a moral failing. Ehrenreich, who holds a Ph.D in cellular immunology (and deserves another in disabusement), explains that our immune cells have their own agenda, often contrary to the wellness of the whole. No matter how mindful, or ascetic, or well-probed by physicians we are, rogue cells will eventually take us out. But on the bright side, it isn't our fault, so we might as well stop worrying and try to enjoy the time we have left. It's no secret that in a previous life this librarian worked as an arborist, so it should come as no surprise that my pick for 2018 Book of the Year is Richard Powers' tree-centered tome, The Overstory. I've been an occasional fan of Powers' often science-based fiction since his 1985 book on/around photography, and this is one of his best. What is the best picture book of the year made of? A bunch of kids of limited means scrounging together castoff materials to build the coolest looking bike you’ve ever seen. The Patchwork Bike is the creation of Australian author Maxine Beneba Clarke and illustrator Van Thanh Rudd, a street artist who paints on cardboard boxes to create a book with a look as unique as the patchwork bike itself. Clarke’s high energy tale presents children empowering themselves within a challenging economic setting and offers American kids a chance to see how much they take for granted. What If It's Us by Becky Albertalli and Adam Silvera—this is an adorable story about two guys who meet by chance at a New York City post office, lose track of each other, wonder "What if..." and then find each other again. Knowing they've only a few weeks together, they fall in love anyway. And love isn't easy—in fact, they have several do-overs. A fun read by the authors of popular YA LGBT books Simon Vs. The Homo Sapiens Agenda (a.k.a. the Love, Simon movie) and They Both Die at the End. Winners Take All: The Elite Charade of Changing the World by Anand Giridharadas is essential reading concerning our democracy and the seismic change in how global elites are pushing for societal problems to get solved. The deeper Giridharadas goes, the more we see how a small group of elites and “thought leaders” articulate solutions that refuse to admit or address the issues that lie at the root of the problem, such as the grand extraction of wealth via capitalism that created and exacerbated these problems in the first place. It's one of the most important books I have read in a long time. Robin by David Itzkoff—I experienced the full range of emotions while reading this biography of the wonderful and strange and complicated person that was Robin Williams. By reading this book you get to know the man behind the myth, and it’s not always joyful (but it often is). The ending of this particular story wrecked me, but it was all worth it to once again feel connected to someone who was so beloved but who never truly accepted just how much he mattered to so many people. Heartland: A Memoir of Working Hard and Being Broke in the Richest Country on Earth by Sarah Smarsh and No Place Like Home: Lessons in Activism from LGBT Kansas by C. J. Janovy—I’m inspired by these books because both relate to social justice for Kansans and advocacy far beyond the state. Sarah Smarsh shares her candid story in Heartland about the socioeconomic class-divide. She writes to her imagined daughter August as her audience, advocating for this imaginary child is a powerful tool for her courage and survival. C.J. Janovy reports in No Place Like Home on personal stories of grassroots battles for lesbian, gay, bisexual, and transgender civil rights. Everyone who supports social justice will gain wisdom from Janovy and Smarsh. My Lady's Choosing by Kitty Curran and Larissa Zageris—who can resist the magic of a Choose Your Own Adventure story? If you never had the thrill of navigating something like an Indiana Jones quest, making actual life or death decisions while flipping pages, then boy, you missed out. Luckily for you, My Lady's Choosing nails the "CYOA for grown ups" concept. To sidestep mortal danger and get that happily ever after with the guy of your dreams (or not! ), you'll have to be witty and wise. It's really funny and has great illustrations, too!